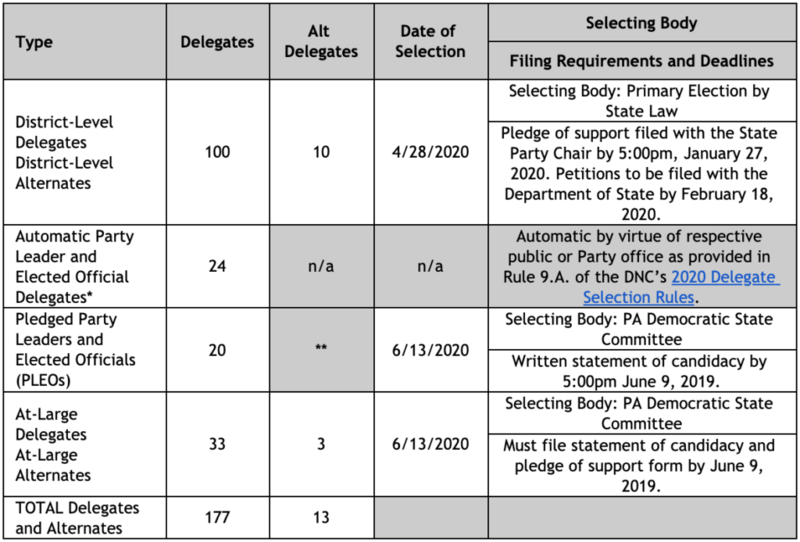 The Pennsylvania Democratic Party this week released draft Delegate Selection Plan for the 2020 Democratic National Convention. The Executive Board of the Pennsylvania Democratic Party is now asking for public comment on the draft plan. The plan details the selection process for Pennsylvania’s 190 delegates and alternates to the Democratic National Convention, which will be held in Milwaukee, Wisconsin, on July 13-16, 2020. 1. On Primary Day 2020, Democratic primary voters at the Congressional District Level will directly elect 100 Delegates and 10 Alternate Delegates. 2. In June 2020, The Democratic State Committee will elect 33 At-Large Delegates, 3 At-Large Alternates, and 20 Pledged Party Leaders and Elected Officials (PLEO) Delegates. 3. 24 members will attain their position by virtue of their Public or Party Office, governed by new DNC Rules. A copy of the entire draft plan is available on the Pennsylvania Democratic Party’s website by clicking here or visiting https://www.padems.com/2020-delegates. The plan may also be obtained by contacting the Party at (717) 920-8470 or by mailing a request to the Pennsylvania Democratic Party, 229 State Street, Harrisburg PA 17101. The draft plan is also now open for public comment at https://www.padems.com/2020-delegates. Comments will be accepted until 5:00 PM on April 30, 2019.